Spring Start Up Tips All tips on in this article should be scrutinized for their application to your individual needs. Everything you need to start your pond up for the spring. Drain pond water using your pond pump. When pond is almost void of water it is time to remove fish and plants. Fish should be stored in a container such as a Rubbermaid Tank or child's plastic swimming pool depending on size and number of fish. They should be kept in original pond water and should be covered with a net to prevent them from jumping out of the container. A small water pump or air pump should be used to supply oxygen to your fish during this period. Potted aquatic plants should be kept moist and in the shade until returned to the pond. We will discuss plants later in this article. After all water has been removed use a soft brush and plastic scoop to remove sludge from the bottom of pond. Power wash the liner and copping stone and remove debris. Waterproof reusable gloves are available for this job. Refill pond with well water, tap water or use a commercial water truck. Add Microbe-Lift Dechlorinator Plus or some other dechlorinator at this time. Dechlorinators instantly neutralize chlorine, chloramines, chlorine dioxide, and other heavy metals. If you are unable to drain your pond, scoop the sludge from bottom of pond and net floating debris. At this time add Microbe-Lift Spring and Summer Cleaner or another Sludge Reducer. These products accelerate the breakdown of leaves, twigs and other accumulated dead organic waste and are harmless to humans, fish and plants. Add Microbe-Lift PL and a dechlorinator if adding water to pond. Examine your equipment for loose and/or cracked fittings and tubing. Tubing and some replacement fittings are available on our site. Clean pump pre-filter, replace pre-filter if worn. Clean pump in-take, check electrical cord of pump for cracks or cuts. Test run pump in shallow water before you submerge pump in deep water. Never hold pump by electric cord and never lift pump by cord. Clean strainer basket and lubricate seal on strainer basket. Check strainer basket for wear or cracks, replace strainer basket if needed. Check electrical cord of pump for cracks or cuts. Do not submerge external pump. Clean filter, bio-balls, beads, foam replacement pads, filter cartridges and or brushes. Replace if worn. See replacement parts. Add Beneficial Bacteria to jump start your filter. For filter pads and filter cartridges try Microbe-Lift PL/Gel. This new technology puts the bacteria right where you want it and it stays there. For bead filters use Microbe-Lift Super Start Bead Filter Bacteria, this reduces buildup of residue in the filter decreasing maintenance and improving filter by avoiding 'channeling'. Check for loose fittings, clean quartz sleeve and look for cracks in sleeve. A cracked or broken sleeve will ruin a new uv bulb. Replace uv bulb every season. See Replacement Bulbs and Quartz Sleeves. The pH of your pond should be between 6.5 and 8.0. Test your water in early morning and test at same time of day when you re-test. Microbe-Lift 7.5 pH Buffer/Stabilizer is a product to be considered. Ideal reading is zero. May rise to 0.25 as pond becomes established. If necessary use Microbe-Lift Nite-Out II. Toxic past 150-200 mg/l Ideal reading is zero. High reading is deadly to fish. When necessary use one of our Ammonia Detoxifiers. Solutions to water quality issues– Partial water changes will help dilute the concentration of Nitrites, Ammonia and/or Nitrates. Don't overfeed and make sure your filtration system is rated for your pond size. Add plants to naturally balance the water and use ammonia remover or Pond Solutions Ultimate to detoxify Ammonia if the reading is more than 0.25. Pond Test Kits are a must for every pond keeper. The pH should be between 6.5 and 8.0. Water temperature of the pond and water temperature of the fish holding tank water must be equalized. Use one of our Pond Thermometers to determine temperature. Equalizing the temperature can be acccomplished by floating the fish in a bag of old pond water in the newly cleaned pond for 15 minutes. After 15 minutes remove and discard one cup of water from the bag and replace it with one cup of clean pond water. Repeat this process three more times at five minute intervals. You can then release the fish into the pond, however you should not dump the water from the bag into your pond. In the spring and late fall it is best to feed your fish Wheat Germ or other low protein food because it is easily digested. During the summer months fish food should be high in proteins. Never feed your fish more than they can eat in five minutes. New ponds can have one inch of fish per sq. ft. of pond surface, established ponds can have two to three inches per sq. ft. of pond surface with proper filtration. filtration. What are some of the signs indicating that my fish are having problems? Not feeding in season, Gasping, Fins close to body, Isolated, Rapid gill movement, Flashing, Change in fins, White covering skin, Gray/White film, Difficulty swimming, Red streaks on skin, Pop eye. See our Fish Disease & Treatment Guide for more information. Pond salt at the rate of 1 and 1/4 cups per 100 gallons of water is an excellent tonic for weak/stressed fish in a pond with plants. The salt reduces stress, adds electrolytes and also improves gill function. In ponds without plants 2 and 1/2 cups per 100 gallons is recommended. 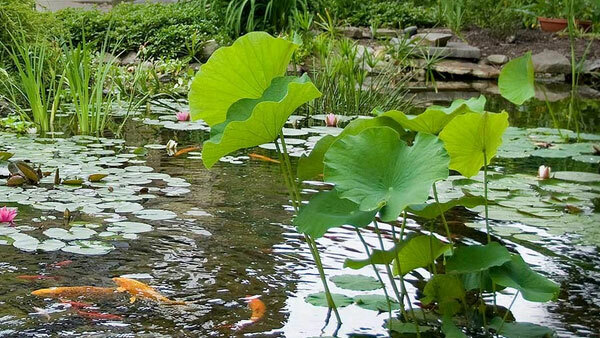 We recommend planting lilies and marginal plants in pots rather than directly in the bottom of the pond. This makes maintenance easier by making the containers retrievable. All of the plants should have at least 5 hours of direct sunlight for maximum growth. Fertilize throughout the growing season using fertilizer tablets at the rate of 1 for every gallon of soil in pot. Should be planted in pots at least 2 to 3 gallon size. Fill the pot half full with aquatic potting soil, add fertilizer tablets, then continue to fill the pot with soil to about 2 inches from the top. The rhizome should be set upright with the roots buried gently in the soil. Make sure the tip of the rhizome is not buried. Next add an inch or two of gravel in order to prevent the soil from escaping from the container. Remember to keep the gravel away from the crown of the rhizome. The plant can now be lowered into the water slowly to a depth of approximately 6 inches. As the plant grows it can be lowered deeper remembering to keep the lily pads on the water surface. Tropical lilies cannot tolerate cold temperatures and should not be planted until the water reaches a temperature of at least 70 degrees. Planting too early can cause dormancy and restrict growth of the plant. Tropicals bloom from late spring through early fall, depending on the weather. Hardy lilies are planted in much the same way as tropicals. The rhizome should be planted at one edge of the pot with the rhizome planted at an angle of about 45 degrees with the crown exposed. Remember to add fertilizer, use a good aquatic soil and top the soil with an inch or two of gravel. Lower the hardy lily into pond as you would a tropical lily. Hardy lilies should be planted in early spring. They bloom from June through September depending on the weather, they become dormant during the colder months and should be kept in the deepest part of the pond. As spring approaches growth will begin again. Marginal/Bog plants should be planted in individual pots of at least one gallon size. Most of our marginal/bog plants are grown in 2 inch net pots and it is recommended that you plant without removing these net pots as not to damage the roots. Plant as you would the lilies but when adding fertilizer tablets, use 1 tablet for 1 gallon pot and 2 tablets for 2 or 3 gallon pot size. Marginal plants should be lowered to a depth of only 2 to 3 inches above top of pot. Remember, tropical marginal plants cannot tolerate cold temperatures. These plants require no planting. Simply place them in the water and they will grow. Feed during growing season with liquid aquatic fertilizer. Floating plants desire warm temperatures and cannot tolerate a frost. All ponds should have underwater oxygenating plants to aid in maintaining clean water. These plants help prevent algae growth and provide oxygen. Oxygenating plants can be planted as you would plant lilies or marginals. A one gallon size pot is recommended. Completely submerge these plants to a depth of at least 12 inches. For best results use one bunch of oxygenating plants for every two square feet of water surface. For example a 4' X 8' pond (4x8=32 divide by 2 = 16 bunches) should have 16 bunches.